No, this isn’t one of those alphabet soup agencies of the Great Depression—the WPA, CCC, and PWA, among so many others; the heroic efforts of an era that made America genuinely great, if you ask me. No, G-B-D is peculiar to me, an observation that I find curiously compelling, yet far too unsophisticated for actual historians of architecture to bother. Those initials represent three hierarchical architectural elements: gable, bay, and dormer; a triune composition not only prominent in middling-sized single-family houses of the 1880s and 1890s, but downright in your face — if you’re looking. 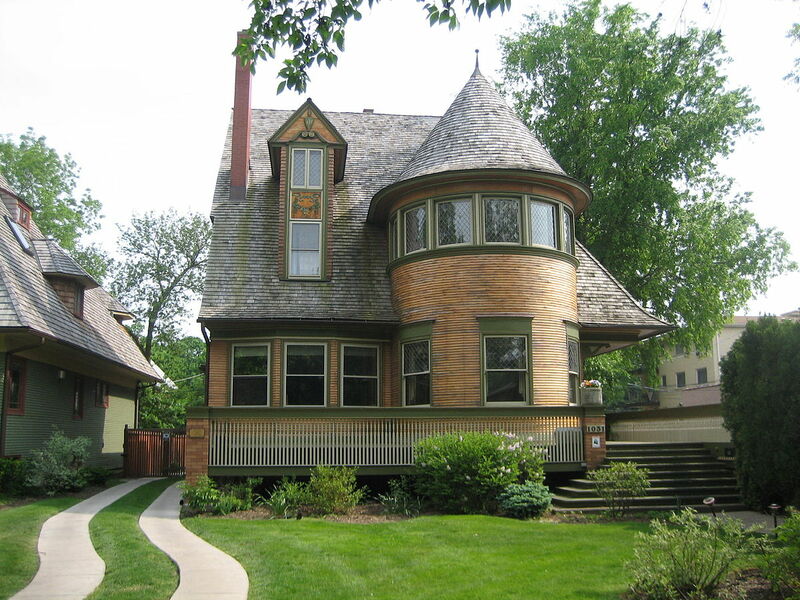 They appear as high style in Frank Lloyd Wright’s Walter Gale house of 1893 — (1) the dominant gable roof (presented to the side yards), (2) the two-story cylindrical bay (jauntily off center), and (3) a balancing dormer (in this case, a dramatic attenuated two-story example). The purity of those shapes is borderline crystalline. 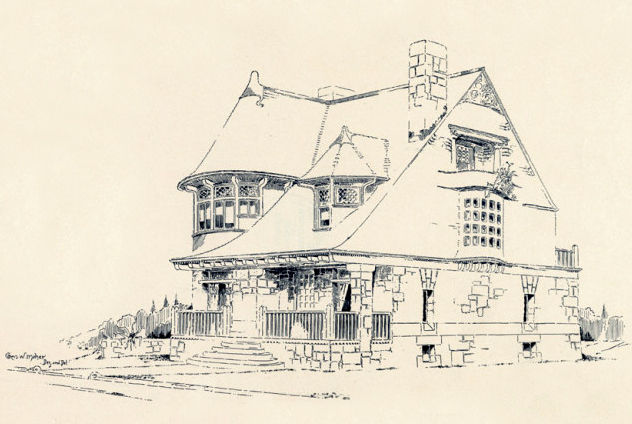 But, while Wright’s idiosyncratic flair allows the Gale house to bear bold witness to his signature style, this was hardly precedent-setting design for mid-decade houses. 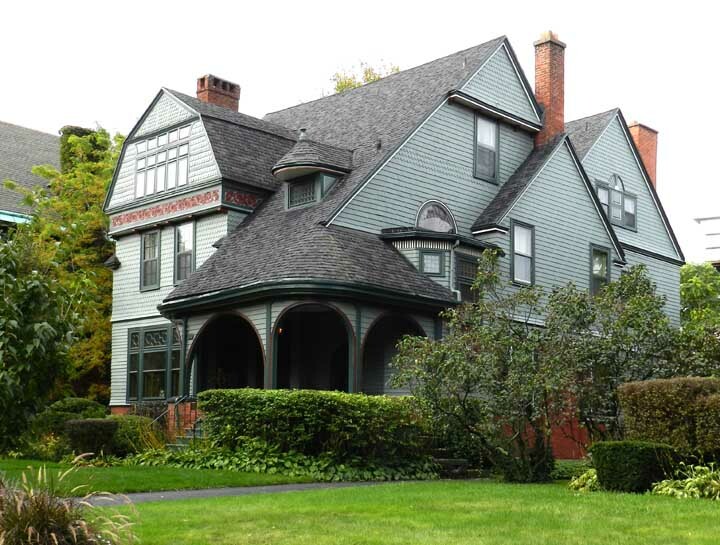 A number of late 19th century American architects were adept at the then current Shingle Style. Among them, Bruce Price (NYC), William Ralph Emerson (Portland, ME, and a nephew of Ralph Waldo), J. Lyman Silsbee (Buffalo and, later, Chicago, where he influence the work of a young Frank Wright), and G. W. Maher (also Chicago), the Coxhead brothers (San Francisco). But there were dozens of others from Mount Desert Island, Maine, to the lumpy landscape of San Francisco Bay. 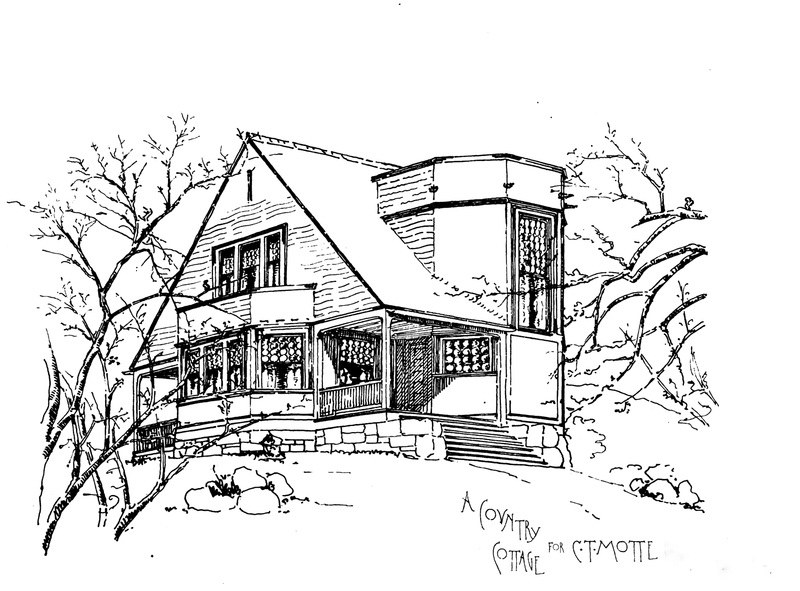 I first noticed the G-B-D triplet in a house by Wright contemporary George Washington Maher, fellow contributor to the Midwestern Progressive movement and one of several Chicagoans linked in the new Prairie Style of 1900. Maher’s Gilman house in Chicago four years earlier, an exercise in the prevalent Shingle Style idiom, displays the same composition, if only a little more mainstream. Maher replicated that composition a few times, and its publication in two architectural journals led to its imitation, if not actual duplication, in several places — one of them my own home base of North Dakota. The Chester Motte residence in Agincourt is yet another. Their common trait is the G-B-D trinity of hierarchical elements: a dominant prismatic gable punctured by a cylindrical (or sometimes polygonal) bay and a tertiary dormer (which can be the exaggerated two-story version or a simple “eyebrow”). But whence cometh such a formula? An Attempt to Order and Phrase Ideas Which have hitherto been only felt by the Instinctive Taste of Designers. And though Robinson does not include a specific example of my G-B-D observed motif, the chapter headings reveal his intentions: Unity–Grouping–Grouping of Subordinate Parts–Appendages–Grouping of Details–etc. In the chapter on “Subordinate Parts”, he includes two of H. H. Richardson’s small public libraries (at Burlington, VT, and Quincy, MA) which play that game exceptionally well, for each subordinates a dormer and stair tower as secondary and tertiary components subsumed by a simple large rectangular mass: 1:2:3. So the now much abused C. F. Mott design (repurposed as a residence in Agincourt for lumberyard magnate Chester Motte) fits right in. Yes, it’s missing the dormer, but I’ll excuse that variation by claiming its role is being played by the living room bay on the right—the dormer slid on its side. And whatever became of “Instinctive Taste”? By agincourtiowa in Uncategorized on Sunday/28/October/2018 .